So, it's missing a bit here and there, like the octave toggle "bat" - the switch still works though. Also missing the transpose switch cap. Some sliders and knobs need to be cleaned, but it does work. ZOMG PC! Thanks for reposting this, I forgot I had it LOL! What am I thinking about right now? I'll give you three guesses..
You're thinking you need a bigger basement? Lol it's gonna be a while. It's way more involved than I assumed when I bought it. I'm hoping to get it in by the end of he month. I need to find a big chunk of time to do it in. Then I was talking about it with STG and he pointed out that with the current pricing of used Juno 6s, I could actually sell that too and pick up a Deepmind 12. Hopefully you will come to see that I do recognize the ridiculousness of my synthing journey, but I feel pretty good about this. I feel pretty good that you feel pretty good about this. PC has the P6, I believe. I also have a P6. I don't think anyone in these parts has an OB-6 though. Since P6 and OB6 desktop versions exists, and dual manual MIDI controllers do exists, it's probably possible to hodgepodge a "dual ProphetOB6", for a fair amount of chump change. I think I'd also rather have a DeepMind than a Juno 6 at this point, although this is mainly judging in demos. Junos are nice sounding but awfully limited. STG has a soft spot for Junos. 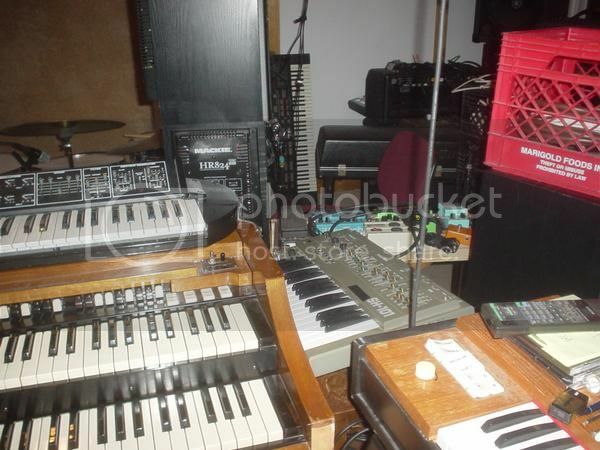 His live rig is down to one Juno 60, but he has a spare Juno 6 and another Juno 60. Now the guy makes incredible music with them, and a lot of people seem to love them, but I never really got attached to them. The one I have showed up in a trade as an offer I truly could not refuse, so I have no issues with getting rid of it. The DM12 does seem like a proper beast. I think it will definitely be a great addition to your setup. christianrock wrote: The DM12 does seem like a proper beast. I think it will definitely be a great addition to your setup. christianrock wrote: I wouldn't mind a DM12+REV2 setup. One smooth, one bright, I think they'd compliment each other really well. DONT TEMP ME - IT SOUNDS LIKE A GREAT IDEA! christianrock wrote: But maybe a DM12+OB6 would work... I'd just hate to have TWO 49 key synths? \. .? No can spend for a while. Wifey hasn't found work yet, and we can't afford to live here if this continues. So, GAS relief is definitely out of the picture, for now.